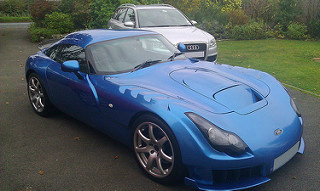 The TVR sports car. 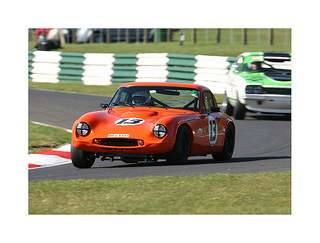 TVR Engineering was established in 1947 by Trevor Wilkinson with the aim of building cars. In 1956, it produced its own glass reinforced plastic (GRP) body shells, as well as steel chassis. 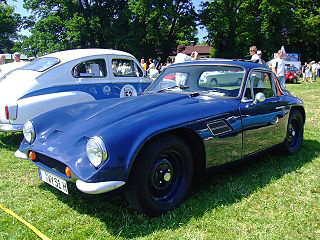 A successful Early TVR was called the Jomar. Within two years, the ground-breaking design of the Grantura was born. The Grantura Mark 1 sports car was launched in 1958, and used a glass reinforced plastic (GRP) body moulded to a steel chassis. It featured a long bonnet, that hinged at the front, and a short rear section. Surprisingly, there was no opening at the rear. Launched in 1960, the Grantura Mark 2 sports car offered a variety of engines, such as 997 cc, Ford 105E, the 1216 cc, Coventry Climax FWE, and the 1588 unit from the MGA Mark 1. It was only built for a few months before being replaced by the Mark 2A. Launched in early 1961, a total of 400 units of the Grantura Mark 2A sports car were built, making it the most popular TVR even built. Powered by the 1622 cc engine from the MGA Mark 2, it produced a top speed of 105 mph, with a 0-60 mph time of 9.6 secs. The Grantura Mark 3 was introduced in 1963. 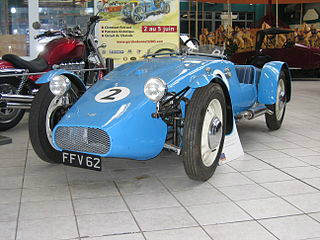 Early models were fitted with the Coventry Climax 1.2 litre, single overhead cam engine, whilst others used the 1622 cc unit from the MGA Mark 2. In 1964, the Grantura's body was restyled to include a Manx-style rear section, and the very distinctive circular rear lights. It was now powered by the 1798 cc engine as used in the MGB, which developed 95 bhp, and gave a top speed of 114 mph, with a 0-60 mph time of 9.9 secs. It was designated the Mark 3 1800S sports car. 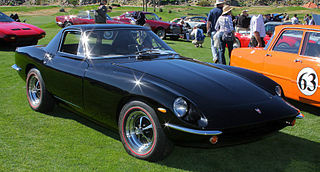 In late 1966, the Grantura Mark 4 sports car was introduced and was, in reality, an upgraded version of the Mark 3 1800S, being powered by the same engine. The heating and ventilation systems were uprated, a stylish wooden dashboard and larger fuel tank were added, and the springs and dampers were replaced to produce a softer ride. Designated the Mark 4 1800S, an estimated 208 units were built, with production ending in 1967. 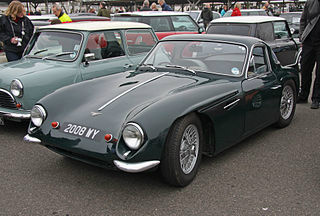 In 1963, the TVR Griffith 200 sports car was introduced. It was, essentially, a TVR Grantura Series 3 in which the 1.8 litre MGB engine was replaced with a standard format of the 4.7 litre (289 cubic inch) Ford Windsor V8 unit, with the more powerful special equipment version being offered as an optional extra. 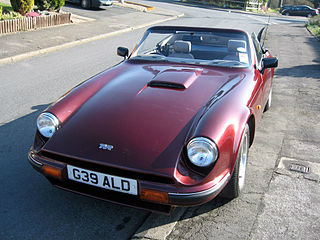 Demand for this rival to the Cobra was such that TVR was inundated with orders. 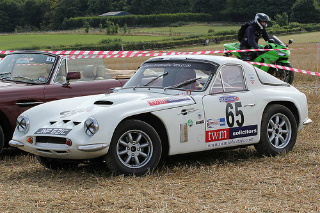 In 1964, the TVR Griffith 200 was replaced by the TVR Griffith 400 sports car. Like its predecessor, it was a two seater coupe. It was fitted with the HI-PO special equipment version of the 289 Ford Windsor V8 unit, and had a higher top speed partly due to its higher back axle ratio. As a result of a prolonged dock strike in the US, by 1966, only 59 Griffith 400 and 10 Griffith 600, with the newer body design, were built, and production ended. Following the demise of the Griffith 400, coachbuilders Carrozzeria Intermeccanica were asked to build a steel-bodied version of the "400". Designated the Griffith 600 sports car, It was powered by a 273 cubic inch Plymouth V8 engine which developed 235 bhp, had a top speed of 130 mph, and a 0-60 mph time of 6.0 secs. Only 6-10 were built by 1966, before the project eventually reverted back to Intermeccanica, who retained control until production ended in 1972. In 1964, Following discussions with an English designer, coach builder Carrozzeria Fissore were asked to present prototypes of a new sports car with a wedge shape design. Designated the TVR Trident sports car, it was powered by 4.7 litre, Ford V8 engine, developing 271 bhp, with a 0-60 mph time of 5.0 secs, and a top speed of 134 mph. Unfortunately, with the collapse of TVR in 1965, the project was reassigned to a TVR dealer who went on to manufacture the Trident himself. 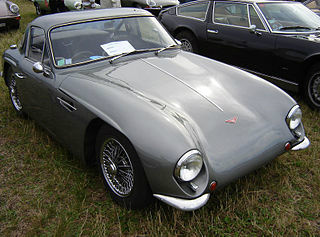 Following the demise of the TVR Griffith 400 in 1965, Martin Lilley, the new owner of TVR, saw the cars' potential and, in 1967, reintroduced this sports car as the Tuscan V8. It was a two seater, fixed head coupe, and used the same 4.7 litre Ford V8 engine as in the early Ford Mustang. It was offered as either the standard 289 unit developing 195 bhp or the special equipment version developing 271 bhp. By 1970, since only 73 Tuscan V8's were built, due to the fact that it was too "thirsty", it was superceeded by the Tuscan V6 sports car. This was powered by a 3 litre, Ford Essex V6 engine plus four speed gearbox, as used in the Ford Capri, Zodiac, and Zephry saloons. 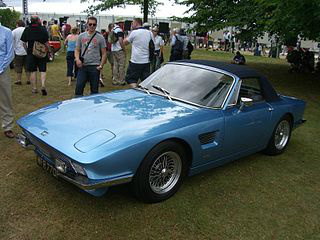 It did not sell as well as it should have and, when production ended in 1971, it was succeeded by the TVR Vixen. 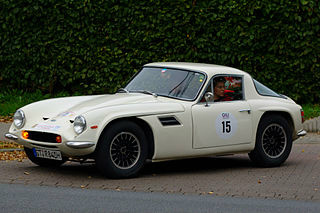 The TVR Vixen Series 1 sports car was introduced in 1967, and succeeded the Grantura Mark 4 1800S. It used a 1.6 litre, 4-cylinder, Ford cross flow engine that replaced the BMC 1.8 litre engine, as used in the 1800S. The fibreglass body was built onto a tubular chassis, with all round independent suspension, using coil springs. 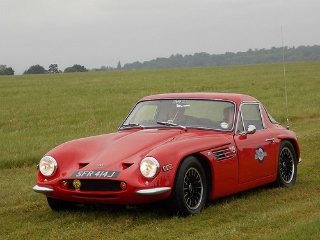 In 1968, the TVR Vixen Series 2 sports car was launched. Although, similar to the Series 1, the main feature was due to the addition of a longer 90 inch wheelbase, which offered greater comfort to the occupants. Furthermore, this was the first TVR model whereby the fibreglass body was bolted, rather than bonded with fibreglass strips, to the chassis. Production ended in 1970, when 438 units of the Series 2 had been built. 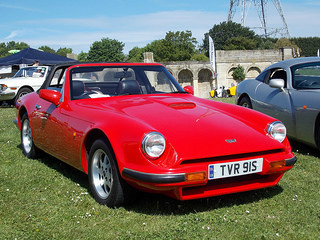 In 1970, the TVR Vixen Series 3 sports car was launched. 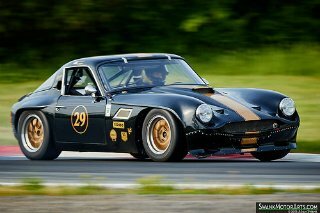 It was powered by the same Ford 1.6 litre, 4-cylinder engine that was used in the Ford Capri 1600 GT saloon. The bonnet was fitted with aeroflow grilles, the same as those used on the Ford Zodiac Mark 4 saloon. Also, the wire wheels were now replaced by cast alloy equivalents. Production ended in April 1972, when a total of 168 units of the Series 3 had been built. 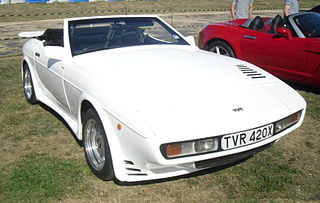 Introduced in 1972, the TVR Vixen Series 4 sports car used the M-Series chassis with the Vixen body shell, but otherwise it was unchanged from the Series 3. After just one year and 23 units built, it was replaced by the TVR 1600M which itself was the forerunner of the M-Series of sports cars. 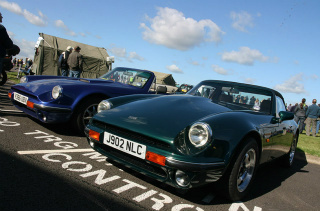 Replacing the TVR Vixen and TVR Tuscan models, the TVR M Series of sports car was launched in 1972. The characterisation of the M-Series was that of a single chassis and shared body style. The Series included the 1600M, 2500M, 3000M, 3000S and 3000M Turbo. 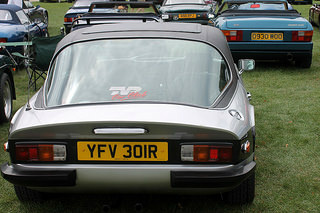 The TVR 1600M sports car was introduced in June 1972 as a two seater, fixed head coupe sports car, and fitted with the same Ford 1.6 litre, 4-cylinder, Kent engine, as used in the Ford Capri GT saloon. Although originally discontinued in 1973, it was relaunched in 1974 following the oil crisis of 1973. 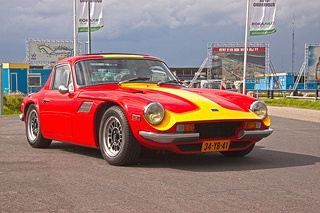 In 1972, the TVR 2500M sports car was introduced, and quickly became the most popular of the new M-Series. It was powered by the Triumph 2.5 litre, straight six engine from the TR6 which developed 106 bhp, and produced a 0-60 mph time of 9.3 secs, with a top speed of 109 mph. Production ended in 1977 when Triumph discontinued the availability of the TR6 engine. 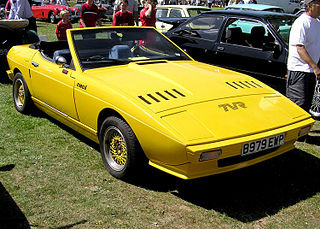 The TVR 3000M was launched at the 1972 Earl's Court Motor Show. Powered by a 3 litre, Ford Essex V6 engine, which developed 142 bhp and 174 ft/lbs of torque, and produced a top speed of 130 mph, with a 0-60 mph time of 7.5 secs. 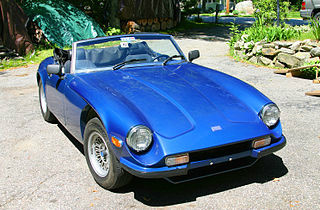 It was the top of the range of M-Series sports car, and was built until 1979. 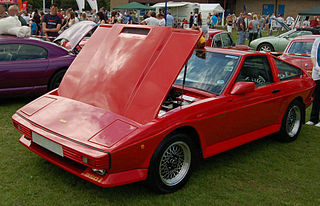 Introduced at the 1976 British International Motor Show at Earl's Court in London, the TVR Taimar sports car was a hatchback version of the 3000M. In terms of mechanics, the two cars were identical. The opening tailgate feature of the Taimar was instrumental in the it outselling the 3000M in its first year of production. 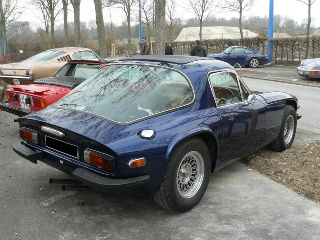 In 1978, the TVR 3000S sports car made its appearance. 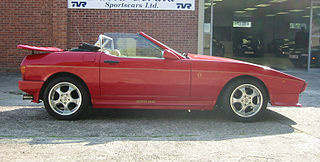 Unlike previous M-Series fixed head coupes, this was a convertible with mechanical components being the same as those used in the 3000M. Most of the body underwent restyling, with the original wind up windows being replaced with removable sliding side curtains that were kept in the boot when not required. 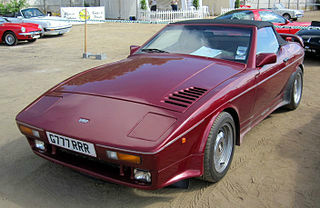 The TVR 3000M Turbo sports car was introduced at the 1975 British International Motor Show in London. Fitted with a turbocharged version of the 3 litre, Ford Essex V6 engine, it developed 230 bhp, and 273 ft/lbs of torque, and produced a top speed of 140 mph, with a 0-60 mph time of 5.7 secs. It has been estimated that a total of 63 Turbos were built, based on the 3000M, 3000S, and Taimar variants. In 1974, as a trial, the Triumph 2.5 litre engine in a TVR 2500M was replaced by a 5 litre (302 cubic inch), Ford Windsor V8 unit. Subsequently, it was agreed to produce the car. 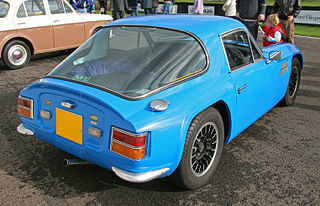 Hence was born the TVR 5000M sports car. It was launched at the 1975 Toronto International Motor Show. Some estimates indicate that only 9 units were built up to 1978 when the M-Series was discontinued. 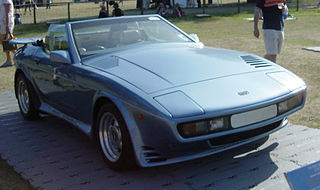 In January 1980, the two seater TVR Tasmin 200 sports car was launched at the Brussels Motor Show. It had a wedge-shaped body, and was available as a convertible, a fixed head coupe, and 2+2 fixed head coupe. The Tasmin's radical shape was not well received, and sales were poor, which was also partly due to its lacklustre performance from its 2 litre Ford Pinto engine. The TVR Tasmin 280i Series 1 was launched in 1980, and powered by a Ford 2.8 litre, Cologne V6 engine, with Bosch K-Jetronic fuel injection. In 1981, the original Series 1 Tasmin 280i were replaced by the Series 2, whilst in 1984, it's name was changed to the TVR 280i. In 1987, it was launched into the US market as the TVR 280i Series 2, and was the last TVR sports car to be exported to the US. 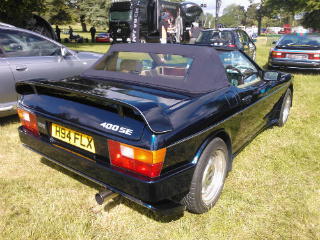 Tht same year, this variant was discontinued and replaced by the TVR S, which used the same engine. 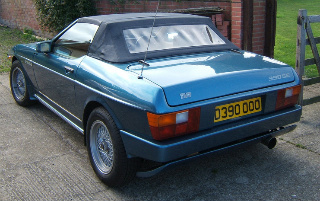 In August 1983, the TVR Tasmin 350i was introduced, although a year later, the name was changed to TVR 350i. It was powered by the 3.5 litre, Bosch K-Jetronic fuel injected, Rover V8 engine, which developed 197 bhp, and 220 ft/lbs of torque. This produced a top speed of 136 mph, with a 0-60 mph time of 6.3 secs, a 0-100 mph time of 16.5 secs, and a standing quarter mile time of 14.8 secs. 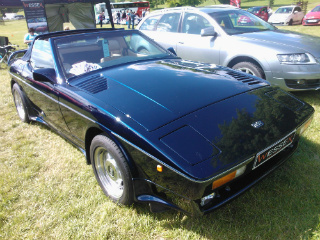 It was the best selling sports car ever built by TVR. The TVR 350SE sports car was introduced in 1990, and was powered by 3.9 litre, Rover V8 engine fitted with a hot wire mass air flow (MAF) fuel injected system. It was a limited edition of 25 units to commemorate the end of production of the best selling TVR 350i. Production ended in 1991. In October 1984, the TVR 390SE was launched, and powered by a 3.5 litre Rover V8 engine that had been bored out to 3.9 litres. In 1988, the 390SE Series 2 sports car was introduced and featured a rounder nose section. Production ended in 1988. In 1988, the TVR 400SE sports car was introduced, and was powered by the 3948 cc Rover V8 engine. It developed 275 bhp and 270 ft/lbs of torque, which produced a top speed of 145 mph, a 0-60 mph time of 5.6 secs, and a 0-100 mph time of 14.8 secs. 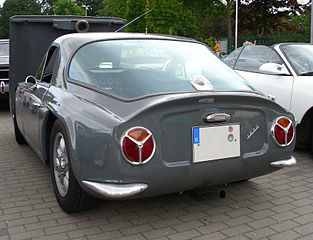 In terms of body styling, it was identical to the 390SE Series 2, with the rounded nose section, and a large aerofoil at the rear appearing under the body. In 1989, the TVR 400SX sports car was launched, and was a more powerful version of the 350SX. It used the same engine as the 400SE, but it featured the addition of a Sprintex Supercharger. In 1991, the TVR 430SE sports car was launched, powered by the 4280 cc Rover V8 engine. This developed 280 bhp, and 305 ft/lbs of torque, and only 3 units of this variant were ever built. In 1986, the TVR 420SE sports car was launched, and powered by a 4228 cc, Rover V8 engine, which developed 300 bhp, and 290 ft/lbs of torque. It was produced until 1987, but only 7 units were ever built. 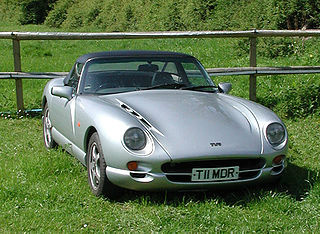 In 1986, the TVR 420SEAC sports car was introduced, powered by the same engine as used in the 420SE. The main feature of this variant was the fact that the body contained at least 20% of the high tech component kevlar, with the remaining 80% consisting of fibreglass. Such a composite structure reduced the weight of this variant, which meant that the 420SEAC now had a top speed of 165 mph, and a 0-60 mph time of 4.7 secs. By 1988, a total of 37 units of this variant had been built. In 1989, the TVR 450SE sports car was launched, powered by the 4.5 litre, Rover V8 engine. It produced 325 bhp, and 310 ft/lbs of torque, with a top speed of 150 mph, and a 0-60 mph time of 5.2 secs. It was only produced for one year when 35 units were built. In 1988, the TVR 450SEAC was introduced, powered by the 4.5 litre, Rover V8 engine, which developed 325 bhp, and 320 ft/lbs of torque. This resulted in a top speed of 175 mph, a 0-60 mph time of 4.5 secs, and a 0-100 mph time of 10.8 secs. LIke the 420SEAC, it used the same high tech body composition of fibreglass and kevlar. When production ended in 1989, a total of 17 units had been built. In 1986, the two seater TVR S Series 1 sports car convertible was launched and was powered by a 2.8 litre, Ford Cologne V6 engine which developed 158 bhp and produced a top speed of 135 mph and a 0-60 mph time of 6.9 secs. This saw a move away from the wedge-shape to the traditional TVR styling incorporating curves. Between 1991 and 1994, the Series 2 to 4 were introduced, all fitted with the 2.9 litre, Ford Cologne V6 engine. When production ended in 1994, 2,604 units of the Series 1 to 4 had been built. Launched in 1991, the TVR V8S sports car used a modified 4 litre, fuel injected, Rover V8 engine. 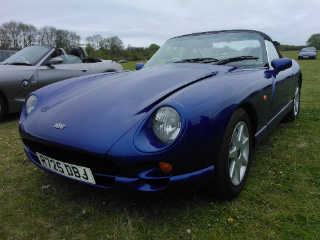 There was also a TVR 2 litre V8S variant, which was a supercharged version of the V8S. It used a modified 3.5 litre Rover V8 engine, with a reduced displacement of 1998 cc, combined with fuel injection and a supercharger. It was a limited edition of just one unit for the Italian market. In 1992, the TVR Griffith sports car was launched, powered by the same 4 litre, Rover V8 engine as in the V8S that it replaced. 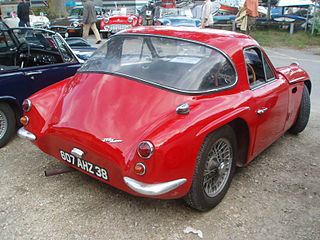 Like the Griffith 200 and 400 of the 60's, it was a lightweight, fibre glass bodied, two seater. All used a five speed manual transmission. Interior design was of a high standard. 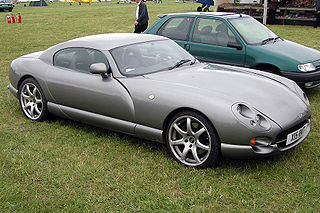 In order to counter the additional power associated with the larger engines scheduled to be added, the chassis used was that from the TVR Tuscan Racer. Initially launched with a 4 litre V8 engine in 1992, the TVR Griffith 500 was quickly followed by the 4.3 litre unit and, later that year, a 4.5 litre variant was introduced. In August 1993, a 5 litre version of the Rover V8 unit, that had been developed by TVR, was launched. This was designated the Griffith 500 and became the most universally known variant. Production ended in 2002 due to the impact of the TVR Chimaera which was, in essence, a more practical version of the Griffith. Also in 1992, the TVR Chimaera sports car was introduced. It was a two seater convertible and, like the Griffith, made use of the same array of Rover V8 engines. It was designed for long distance motoring, and was therefore more spacious, internally, and its suspension was less firm than that of the Griffith. The engine spec was as per the Griffith, although there were minor improvements in top speed. The TVR Cerbera sports car was launched in 1996, was powered by the AJP8 4.2 litre, V8 engine, developing 360 bhp, and a top speed of 180 mph. In July 1997, the AJP8 4.5 litre, V8 was introduced and followed, in 2002, with the Cerbera 4.5 Red Rose, developing 440 bhp, and 402 ft/lbs of torque, and producing a top speed of 193 mph, a 0-60 mph time of 3.9 secs, and a 0-100 mph time of 8.3 secs. The Cerbera was discontinued in 2003. 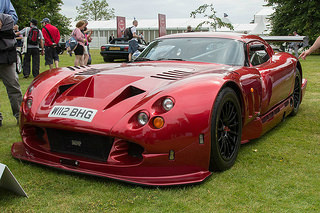 The TVR Cerbera Speed 12 sports car, introduced in 2000, was planned to be the world's top performing road car. Powered by a 12-cylinder, 7.7 litre engine developing 960 bhp, it produced a higher top speed of 240 mph, a 0-60 mph time of 2.9 secs, and a 0-100 mph time of 6.3 secs. It would outperform a McLaren F1. One road test report described the car as: "terrifyingly quick". 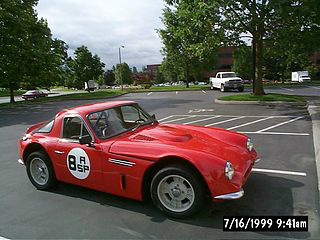 As a result of its phenomenal performance, it was regarded by TVR as inappropriate as a road car, and production was halted. 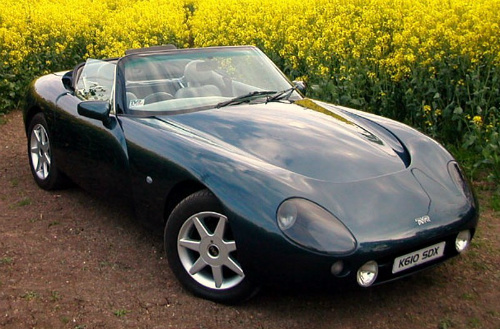 Launched in 1999, the TVR Tuscan Speed Six Mark 1 sports car was fitted with a 3.6 litre Speed Six engine developing 350 bhp, and producing a top speed of 170 mph, with a 0-60 mph time of 4.4 secs, and a 0-100 mph time of 9.8 secs. These were followed by the "S" (400 bhp) and "Red Rose" variants (380 bhp) whilst, in 2005, the Mark 2 version was introduced. Instead of the usual fibreglass, the body was constructed of composite material formed in a honeycomb. Another variant was the Tuscan R, with the T440R producing a top speed of 200+ mph with a 0-60 mph time of 3.7 secs. Launched in 2004, the TVR Typhon sports car was powered by a 4.2 litre, TVR Speed Six engine, linked to a TVR Vortech supercharger, developing 580 bhp and 467 ft/lbs of torque, with a top speed of 215 mph, and a 0-60 mph time of 3.6 secs. It fearured a carbon fibre body and a steel space frame chassis, reinforced with aluminium honeycomb sections, with an integral steel roll cage, and a floor pan made of carbon fibre. Unfortunately, the Typhon had cost far more in terms of labour and development costs than had been anticipated, and was the reason why production was halted in that same year. 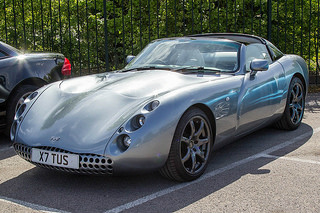 Launched in 2002, the two seater TVR T350 sports car was powered by TVR's own 3.6 litre, inline 6-cylinder, Speed Six engine, with four valves per cylinder. It developed 350 bhp at 7200 rpm, and 290 ft/lbs of torque at 5500 rpm, and produced a top speed of 175 mph, a 0-60 mph time of 4.2 secs, and a 0-100 mph time of 9.1 secs. The T350 was available as either a Targa variant, designated the T350T, or a fixed head coupe, designated the T350C. Production ended in 2006 when a combined total of 300 units of the two variants had been built. 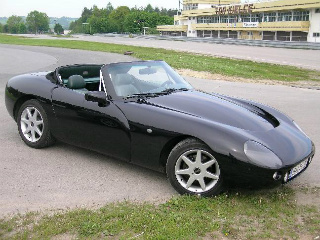 Launched in 2002, the TVR Tamora sports car was marketed as an entry level model to the TVR range. Powered by the company's own 3.6 litre, double overhead cam, straight 6-cylinder Speed Six engine, it developed 350 bhp at 7200 rpm, and 290 ft/lbs of torque at 5500 rpm. This enabled it to produced a top speed of 175 mph, with a 0-60 mph time of 4.2 secs, a 0-100 mph time of 9.1 secs, and a standing quarter mile time of 12.5 secs. In terms of sales, it was not a winner and was discontinued in 2006. Introduced in 2005, the TVR Sagaris sports car was fitted with a 4 litre, TVR 6-cylinder, twin overhead cam, Speed Six engine, which developed 406 bhp at 7500 rpm, and 349 ft/lbs of torque at 5000 rpm. With a huge compression ratio of 12.2:1, it had a top speed of 185 mph, a 0-60 mph time of 3.7 secs, and a 0-100 mph time of 8.1 secs. 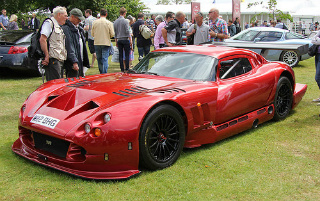 The Sagaris was the last TVR to be built and, by 2006 when production ended, the total output was in the low hundreds. 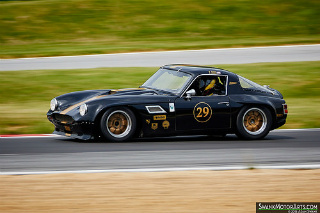 In 1986, the works racer, the TVR 420SEAC sports car, was banned by the authorities from any further race meetings. In 1988, TVR set up their own one make Championship called the TVR Tuscan Challenge. 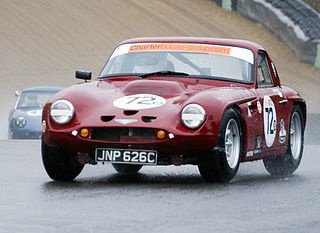 They then introduced the TVR Tuscan Racer which was, initially, the only car to race in this event. The series turned out to be very popular with extensive TV coverage. 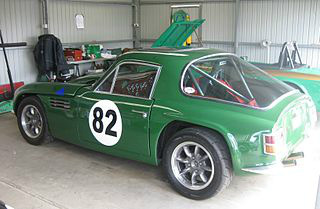 After two changes of engine, the Tuscan Racer was finally powered by the 4.5 litre, TVR Speed Eight engine, which developed 450 bhp, and 380 ft/lbs of torque, and produced a top speed of 190 mph, with a 0-60 mph time of 3.9 secs, and a 0-100 mph time of 6.9 secs. 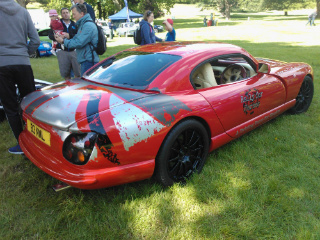 Got any stories about Your Favourite TVR Sports Car?